A Sydney Harbour Cruise makes for one for a unique and tasteful gift that will appease people for any occasion. With a wide variety of differing cruise types to choose from, they will be able to hop aboard their cruise of choice and enjoy gorgeous views along with a relaxing ride. Soak in the sun, indulge in some food, and take in all of Sydney's surrounding icons. 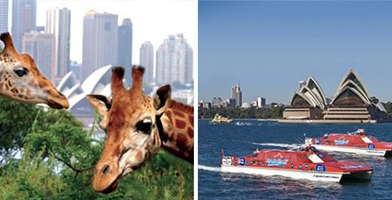 Take the Zoo Express to visit Sydney's renowned Taronga Zoo, or enjoy the beautiful sights of Sydney with a scenic harbour cruise. Send them to visit Taronga Zoo in Sydney with this ferry pass from Darling Harbour or Circular Quay, Sky Safari Sable Car & entry voucher! Gift It Now here! The best value Sydney Harbour sightseeing cruise available, you'll see all the best-known landmarks while listening to GPS commentary!